According to the data compiled by the .ES domain registry, as of April 2014 there have been 3,451,863 domain names registered in Spain. More than half of them (50,04 %) were registered by businesses and individuals under the country code domain .ES. A large portion of the Spanish domain market is shared by other TLDs, mainly .COM (35,29 %) with 1,727,169 registrations. 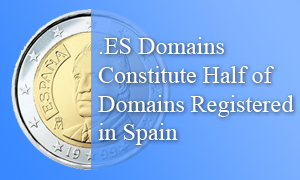 Similarly, the composition of domains within the country code domain shows major dominance of the .ES extension over other sub-domains with 1, 619, 141 registrations in .ES of the total 1, 727,288 registered domains. The .COM.ES is second with 85, 663 registrations followed by .ORG.ES with 14, 862 registrations. If you are interested in establishing online presence on the Spanish market or wish to register any other domain name, please click on the domain of your choice to find out more about its registration procedures. If you need assistance or have any questions, please contact our Support Team at support@web-solutions.eu or via phone on +44 (0) 208 133 3994.